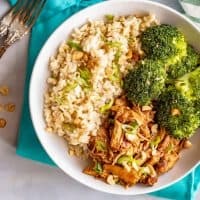 Honey garlic chicken rice bowls with brown rice and steamed broccoli are simple and full of flavor. Drizzle extra sauce over your entire plate and be ready to dig in! We are recovering from some winter colds at my house… I seem to have dodged the bullet but it’ll be a few more days until I’m really in the clear. Seems to be going around – I know so many people who are laid up right now. Y’all stay healthy! But before I get all teary, let’s move on to the food today! 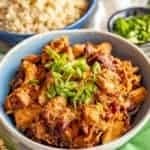 I’m pretty much just showing you what I love to do with either serving the main dish or using leftovers when I make my 15-minute honey garlic chicken or slow cooker honey garlic chicken, which I shared last week. Which is why I love making these bowls. 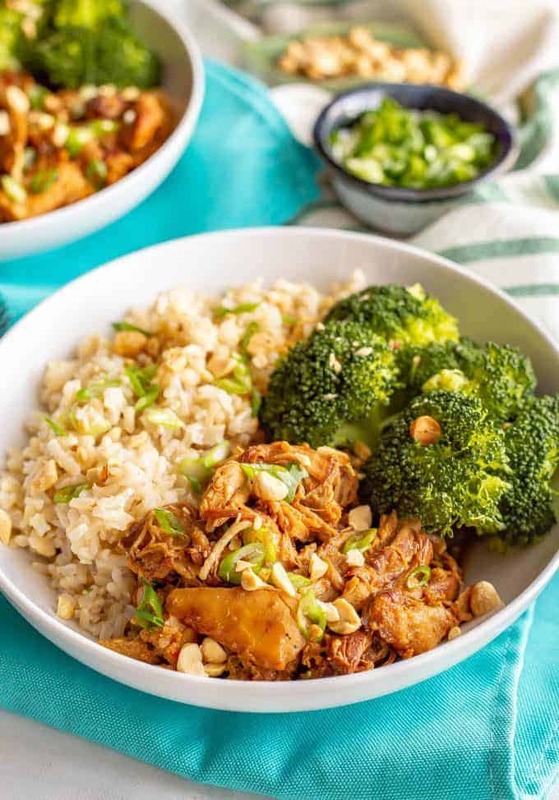 You add your honey garlic chicken, your rice and your broccoli and then you drizzle, drizzle, drizzle away with that sauce to get everything coated and scrumptious. 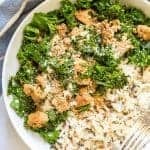 And while this is more of an “assembly” type of meal than a real recipe, I do have lots of substitutions and ideas for you so you can change it up and make it your very own. I use steamed brown rice, but you could substitute regular white rice here if that’s what your family likes. 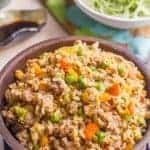 You could also go low-carb and use my easy cauliflower rice instead of regular rice. 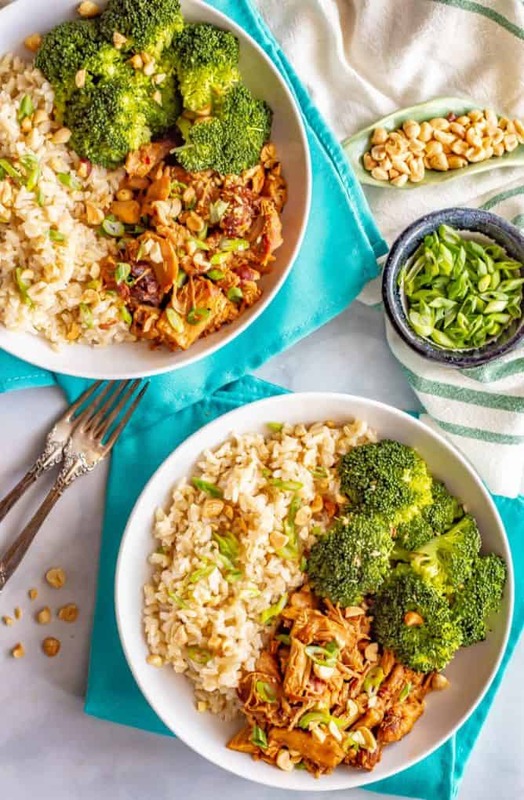 Broccoli is my favorite pairing for these bowls, but green peas (thawed and warmed up from frozen) or snow peas (lightly steamed) would also be good options. You could even use some wilted greens like spinach or Swiss chard for the veggie. 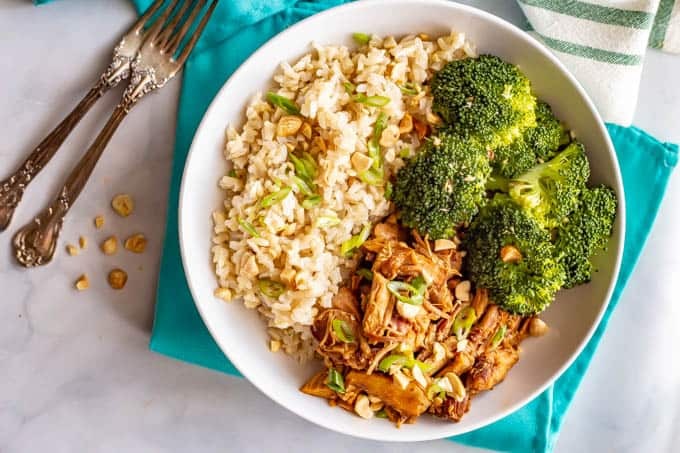 Or, if you want to change this up from rice altogether, free free to serve it over quinoa, rice noodles or a long-thin noodle like angel hair to make a honey garlic chicken pasta bowl. I also included in the notes of the recipe card how to quickly make some extra sauce, in case you don’t have enough leftover. It would be a shame not to have enough sauce for drizzling! And just like the originals, you can doctor these bowls up with your favorite toppings! These bowls are also great for meal prepping. 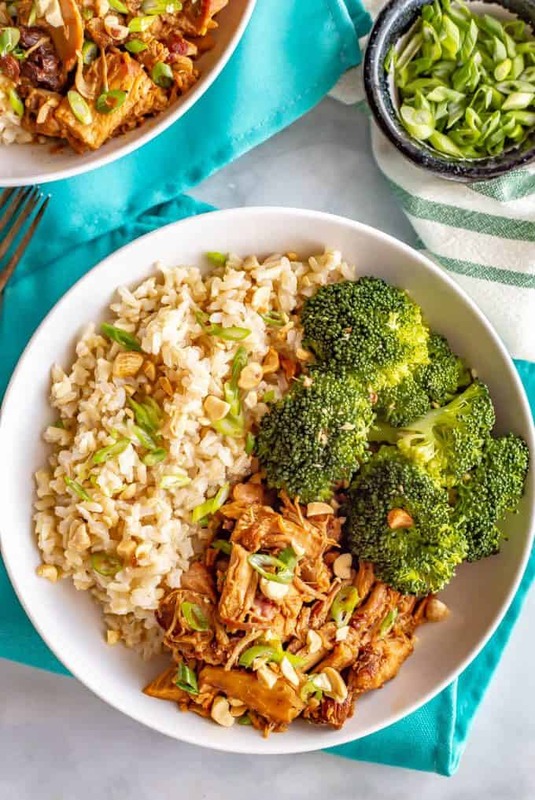 Just layer up your containers with the rice, chicken and veggies, top with sauce, and stack them up to have lunch or dinner ready to reheat later in the week. Meanwhile, steam broccoli until fork tender, about 7-8 minutes. Reheat leftover chicken and sauce in the microwave. 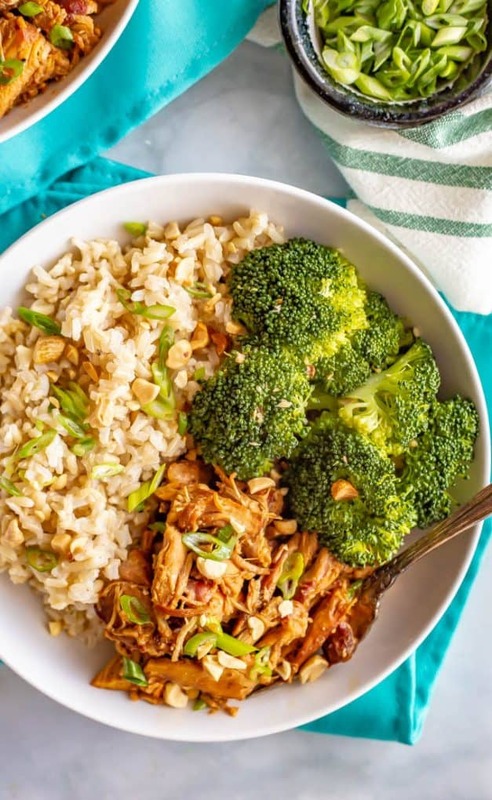 Divide the cooked rice and broccoli among four bowls then add 1/2 cup honey garlic chicken to each bowl. Drizzle any extra (rewarmed) sauce over the entire bowl. 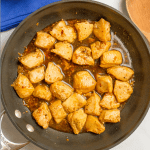 Need a recipe for the honey garlic chicken? 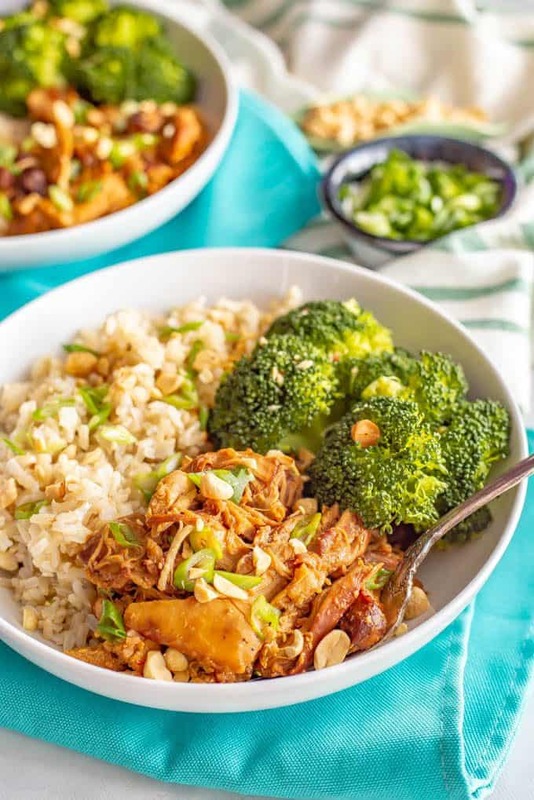 Check out my 15-minute stovetop honey garlic chicken or my slow cooker honey garlic chicken. I use steamed brown rice, but you could substitute regular white rice here if that’s what your family likes. 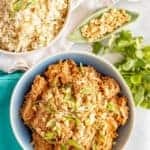 You could also go low-carb and use my easy cauliflower rice Instead of regular rice. Or even substitute quinoa, rice noodles or a long-thin noodle like angel hair in place of the rice. 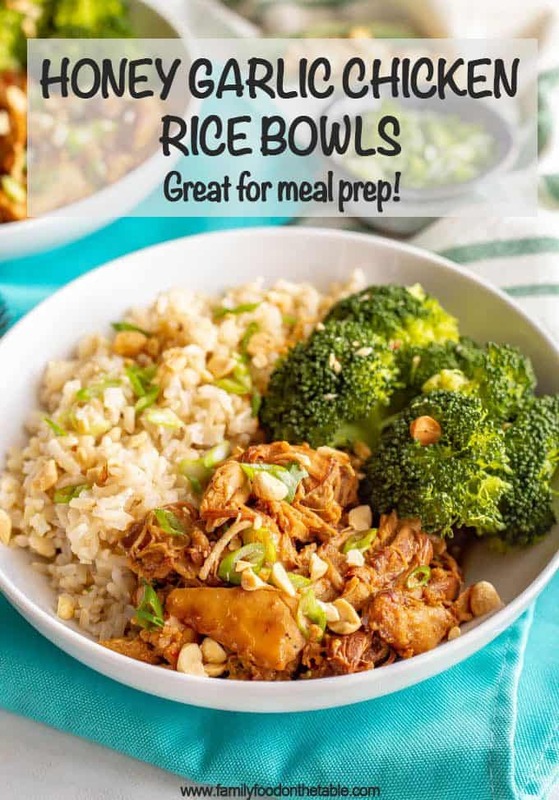 Broccoli is my favorite pairing for these bowls, but green peas (thawed and warmed up from frozen) or snow peas (lightly steamed) would also be good options. You could also use a wilted green like spinach or Swiss chard for the veggie. Need extra sauce to drizzle over everything? 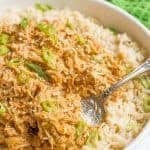 You can mix up the following in a small bowl or jar to use for more sauce: 2 tablespoons honey, 2 tablespoons low-sodium soy sauce, 2 cloves minced garlic and a pinch of red pepper flakes.